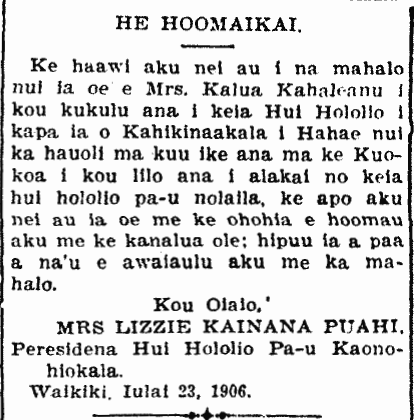 Pāʻū riding a hundred ten years ago and more, 1906. The Riders Expect to Have a Very Big Turnout. The Association of Pa-u Riders, otherwise known as the Hui Holopa-u Maile Alii, is making great preparations for its parade of Pa-u riders on Monday, June 11. 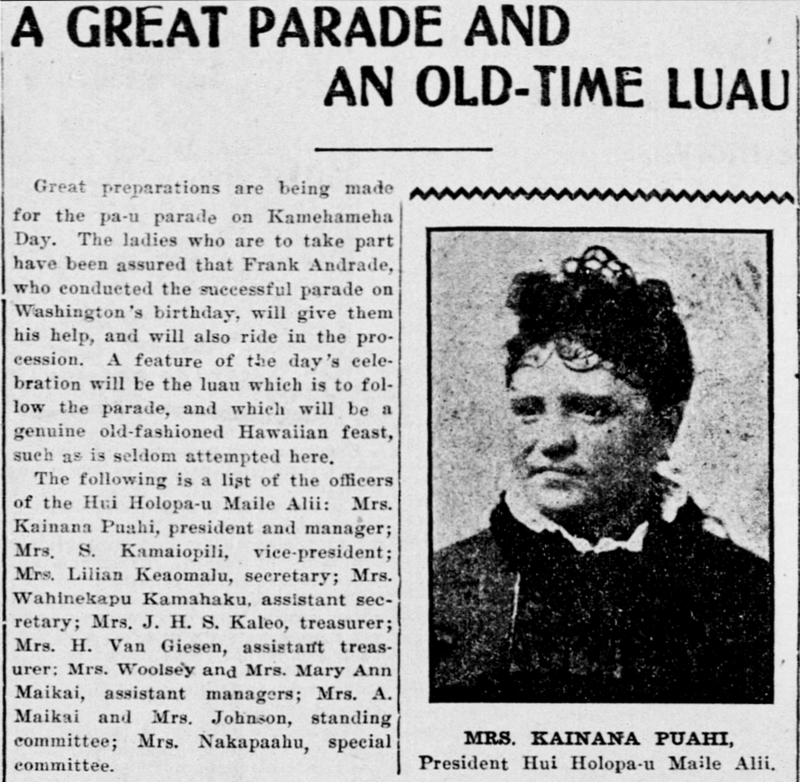 This society formed by Mrs. Kaimana [Kainana] Puahi and others interested in the preservation of the old Hawaiian manner of horseback riding with the picturesque pa-u immediately following the floral parade of Washington’s birthday, of which parade the pa-u riders formed one of the most attractive features. 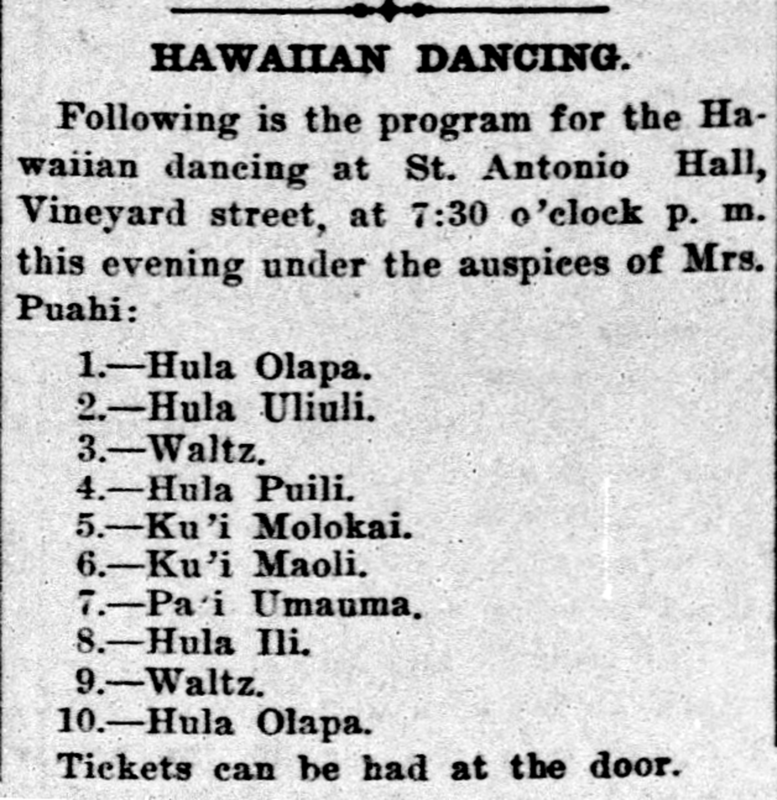 The ladies have since devoted much time to practice, and to the making of appropriate dresses, and have been helped by the members of the Promotion Committee, by Manager Charles Crane of the Hawaiian Gazette Co. and by many others, to all of whom the members of the Hui Holopa-u Maile Alii wish to return their most sincere thanks. Hula at St. Antonio Hall, by Kainana Puahi 1907. Tickets can be had at the door. The Pacific Commercial Advertiser, Volume XLV, Number 7657, Page 5. February 22, 1907. Kalua Kahaleanu and her pāʻū riding group, Kahikinaakala i Haehae, 1906. I give my thanks to you, Mrs. Kalua Kahaleanu, for your establishing this Horse-Riding Group called Kahikinaakala i Haehae; I was elated to see in the Kuokoa that you became leader of that pa-u horse-riding group, so I accept you that you may carry on with delight and with no doubts; tied together securely, and it is I who will bind us together with appreciation. President of the Pa-u Riding Group Kaonohiokala. Ka Nupepa Kuokoa, Buke XLV, Helu 31, Aoao 4. Augate 3, 1906. Great preparations are being made for the pa-u parade on Kamehameha Day. The ladies who are to take part have been assured that Frank Andrade, who conducted the successful parade on Washington’s birthday, will give them his help, and will also ride in the procession. A feature of the day’s celebration will be the luau which is to follow the parade, and which will be a genuine old-fashioned Hawaiian feast, such as is seldom attempted here. The following is a list of the officers of the Hui Holopa-u Maile Alii: Mrs. Kainana Puahi, president and manager; Mrs. S. Kamaiopili, vice-president; Mrs. Lilian Keaomalu, secretary; Mrs. Wahinekapu Kamahaku, assistant secretary; Mrs. J. H. S. Kaleo, treasurer; Mrs. H. Van Giesen, assistant treasurer; Mrs. Woolsey and Mrs. Mary Ann Maikai, assistant managers; Mrs. A. Maikai and Mrs. Johnson, standing committee; Mrs. Nakapaahu, special committee. President Hui Holopa-u Maile Alii. The Pacific Commercial Advertiser, Volume XLIII, Number 7436, Page 5. June 8, 1906.